Locomalito is the developer behind Hydorah, Maldita Castilla, The Curse of Issyos, and numerous other titles mirroring the styles of classic arcade games. For many years, the developer released all of his games on PC for free, but recently he has been working with Abylight Studios to release enhanced versions of his games, with the first being Maldita Castilla EX (a.k.a. Cursed Castilla). 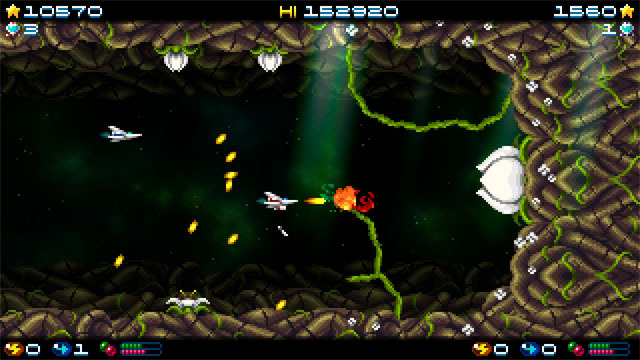 Now his first breakout hit, Hydorah, is being released as Super Hydorah, with enhanced visuals and several entirely new levels, enemies, and bosses. This is a horizontal shmup modeled after 80's arcade games like Gradius, R-Type, and Darius, featuring a variety of weapon types, waves of enemies, huge bosses, and 2P co-op. The game also features numerous branching paths as well as multiple endings, encouraging players to replay the game to see everything that it has to offer. The game is headed to PC via Steam and Xbox One via Microsoft Store but does not yet have an announced release date. Players looking to check out the original game may download it for free from the developer's website.